With shamans’ things it was never their crest…It was whatever came to them in a dream. Haida shamans, both men and women, wore images of the helping spirits that came to them in dreams and visions. 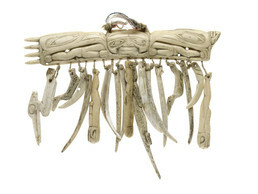 On this finely carved bone amulet, the heads of birds flank a human face; heron, land otter, and dog salmon, all recorded as spirit assistants in oral tradition, can be identified among the figures suspended below. Amulets worn from the neck were sometimes called head-scratchers, suggesting the purpose of the sharp points on the left side of this piece. A shaman never cut, combed, or washed his or her hair, because it was a source of spiritual strength.